Today is the one year anniversary of the last time I saw my mother, and the last time I will ever see her. For many people, this would be a horrible day, but for me, it is a victory. I knew from a very young age that my mother was not capable of loving me. She was empty, disinterested and detached. Caring for me was a hassle and a waste of her time. Supporting me kept her from buying the things she wanted. Having to stay home with me prevented her from doing the fun things she wanted to do. Listening to me was a burden. She claimed she’d always wanted a child, and she even went through years of fertility treatments to have me, but once I was born, she had many excuses not to be around me. Sure, she had a job, but it was just 40 hours a week. She could have been a mother after work, (like I am to my children,) but she wanted to escape after work. She said she needed a break…but every day, every night, every weekend was her break. Sometimes, she’d leave me with relatives for weeks at a time. Even during the school year, if picking me up from her parents’ house was inconvenient, she’d just leave me there. My school principal called her more than once about truancy because I wasn’t in school. When I was nine, she started leaving me home alone. All of my friends, (and other neighborhood kids,) knew my house was the home with no parents, no rules, and no real food. Even today, my long-time friends recall that they rarely saw my mom even though they played at my house frequently. When I was 14, I got my first job, and from then on my mother felt obligated to only supply the bare minimum. I had to purchase my own food, clothes, school supplies, car, insurance and more. While other kids were enjoying high school, I was working all the time. As I became an adult, she made it clear that she did not respect me, my boundaries, my goals for my life or my privacy. It seemed like she would build up and explode every few months, and every time, her explosions got worse. Multiple times, I cut contact for months or years only to give her another chance when I longed for a mother. Every time, she came back worse. She has blabbed my secrets, stolen my credit card, sabotaged jobs, stalked me at work, pretended to be me to get my unlisted phone number, gotten into my bank account, dragged garbage into my house, destroyed my belongings, (or given or thrown them away,) disrespected my parenting wishes, told me vulgar stories about my dad, (her ex-husband from over 30 years ago,) threatened to beat my face in, threatened to have her sister kill me, harassed my dad, harassed my dad’s wife at work, and more. I simply do not think that these things belong in a healthy life or a normal mother-daughter relationship, and I do not think I am wrong. None of us should be accepting this kind of behavior from ANYONE. I don’t feel that a biological tie means I should continue to be emotionally, (or possibly physically,) trampled on. And I am NOT going to be guilt-tripped into believing I should! 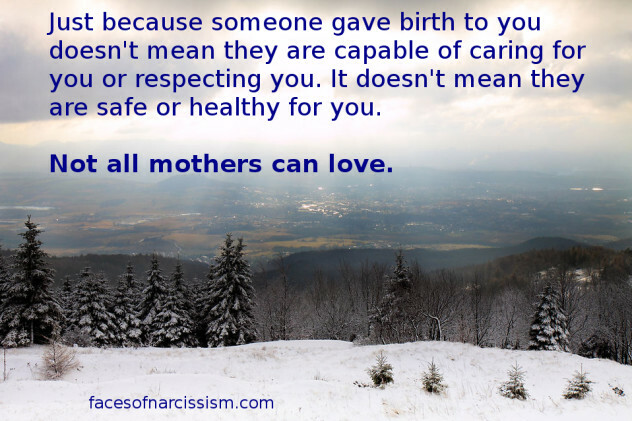 Narcissistic mothers can pretend to be loving, concerned angelic moms in public, while acting like possessed maniacs at home. I know the reality of what I saw and went through for many years. Her last incident was cruel and manipulative, and she smirked while she did something very hateful to me. She lied and created a bunch of unnecessary drama that cost me valuable time and money. That was her last chance. I am not letting that poison back in my life. Happy one year anniversary to me!!! Take back your Spring after narcissistic abuse!